Change Maker Catalyst Award Recipient, Julia Malinosky, spent her summer interning with Philadelphia Academies, Inc. to support youth through career technical academies. Julia is majoring in Business Management with a minor in Social Innovation and Social Entrepreneurship. Think about yourself as a child. Maybe you were energetic and bubbly, or possibly more shy and reserved. Think about yourself now. Many similar traits have persisted, but I bet you have matured wonderfully. Wherever you are now, think about how many people have influenced the person you have become. Especially think about the people who might have had a positive influence, and how meaningful their impact was to you. If you feel you haven’t had many positive influences, think about how strong you are, but also about how some support could have been helpful. I care about youth development because it is an opportunity to make a meaningful, positive impact during a critical time in a person’s life. Childhood is such an important period of forming perceptions of the world because these perceptions become our basis for making decisions as children, which then influence our perceptions and decisions as adults. As we grow into adults, we find ourselves in a cycle of thought and behavior started from ideas we somehow learned by listening and observing as a child. On each step of our path, as we acquire more knowledge and resources, it is important to share them with others. This is how we lift each other up. Lifting children up prepares them for life ahead. By providing them with the resources they need, with assistance while they travel their path, we greatly strengthen their opportunity for success, and entering a positive cycle of decision-making. So there I was, in early April in Tulane’s famous Howard-Tilton library, wondering what I could do with myself for the upcoming summer to help lift children up. 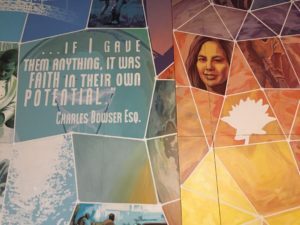 I remembered the Changemaker Catalyst Award, how it could help support unpaid internships, and also how the application was due in nearly a week. With a tough Spring semester, I found myself in a bit of a time crunch, but I knew this was an opportunity to actively make change and explore my interests, as opposed to returning to retail work at the mall, as I did last summer. I asked my mom to advertise on her Facebook page for any available positions in business and youth development. With the help of my mom and her network, my mom’s coworker’s cousin was able to pass my resume and cover letter along to the president of Philadelphia Academies, Inc., who thought I would be a good fit for the organization. And it happened just like that. Before starting work, I met with Human Resources for an interview, where they asked about my interests, skills, and experiences, while trying to get an idea of where I would best fit in the organization. I wrote in my cover letter about how as a freshman with minimal work experience and broad interests, I was open to helping anywhere the organization could use me. But during this meeting, I came to a realization about how very little I actually knew about the functioning business side of organizations. I had a similar realization yet again later that week when I had to ask my supervisor what a hang folder was (for those of you who might be in the same boat I was in, it is quite literally a folder that hangs in a filing cabinet). I clearly had some room for growth. I was so excited to start the position because I felt I was truly prototyping a realistic possibility for my future. I was excited to learn more about employment in the business field but also about the work Philadelphia Academies does to support youth. Because the opportunity was the result of a referral, the organization wasn’t one I had found on my own. I am grateful for this because the organization exposed me to a different method of supporting youth than I would have been independently drawn to. 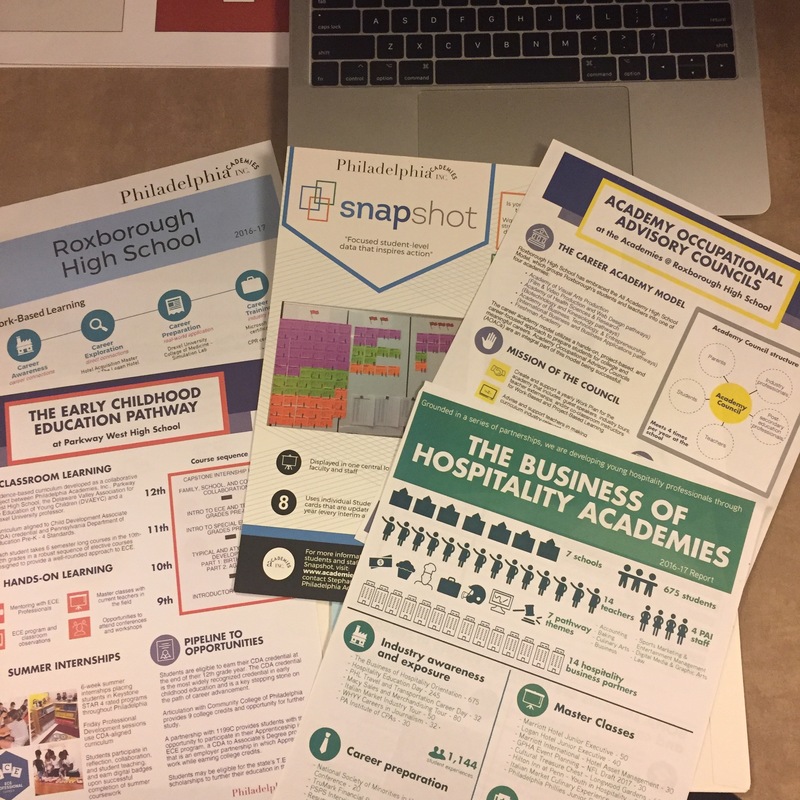 Philadelphia Academies focuses on making high school personally relevant by connecting students to a career pathway that coincides with their interests. They help facilitate industry-themed academies within high schools where experiential, hands-on learning and long-term student evaluation are top priorities. Before Philadelphia Academies, I had never heard of career academies and didn’t have a particular interest in the technical, or trade, education, of which many of the academies are focused on. I had mainly taken to hands-on work with students as a volunteer, but Philadelphia Academies works a step above, supporting those who work more directly with the students, such as teachers and business mentors. My work days and weeks were all a bit different, requiring different skills and different skill levels. My supervisor thought of various ways I could support and learn from the organization in a manner that allowed me to explore the multiple interests that I had expressed in my initial interview. I was able to advance my general business and administrative knowledge in ways such as helping the Finance Department with filing, scanning, and organizing. I also accomplished a large amount of data entry for the Data Specialist. My favorite responsibility was completing research projects. Researching felt a lot like reading for pleasure because I was learning so much about topics I’m interested in, such as education methods and Philadelphia education. I loved how I was simultaneously sifting and summarizing the information for the company to use in creating programs and projects. I was able to complete research projects for the Career Pathway Strategies Director, Data Specialist, and the Chief of Staff. Some of the topics I studied included: new tools the district is using for education, potential community partners, social media strategy, and best practices in career-connected education. Perhaps my favorite research project was about “best practices in career-connected education across the country”. I enjoyed this research because I learned about how different organizations and schools were all implementing unique methods to provide support in the area of career readiness. For example, I learned about Conemaugh Valley High School of Johnstown, PA who created a fully functioning credit union branch inside of the high school. Students enrolled in a finance class can work for two days a week at the school branch, and also take field trips to serve real-world customers at other branch locations. Another high school, Mt. Diablo High School in Concord, CA, addresses career-readiness by using a career academy, called the Digital Safari Academy. Throughout junior and senior year students participate in a simulation of a digital marketing agency, where they role play different positions and take on real clients. They are guided through a summer internship and have access to former CEOs as mentors. 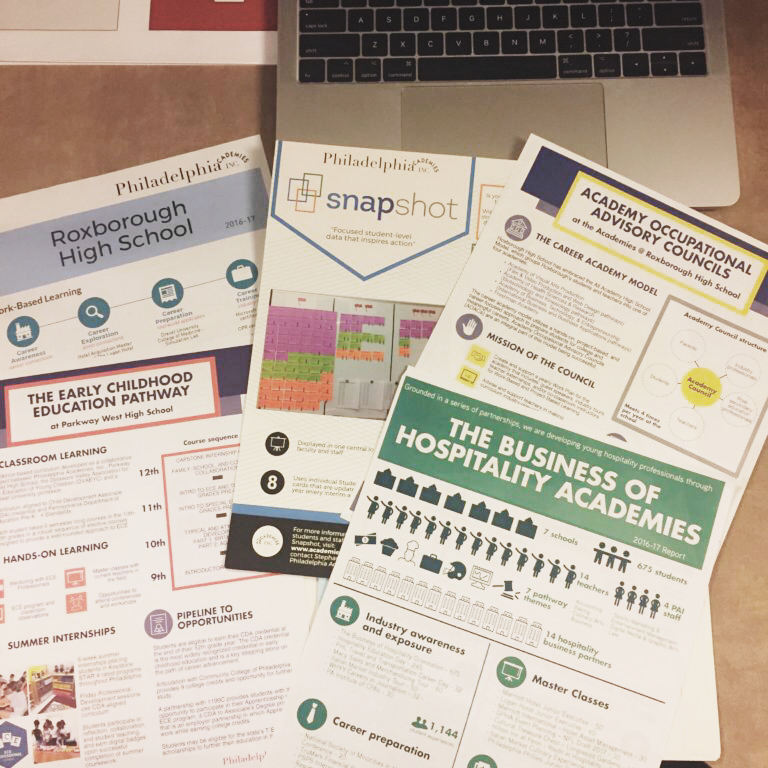 Both high schools, in addition to other high schools and organizations, are providing career-readiness supplements in completely different ways. While their approaches may be different, I was able to find trends in the most effective practices, such as having a mentor to guide students through their work experiences, and requiring the students to complete organized reflection. Throughout my time with Philadelphia Academies, I learned practical skills, useful information about youth education, and insights into changemaking. My biggest takeaway is the idea that changemaking can look many different ways. This is true between organizations trying to solve the same issue, within a singular organization, and even for an individual person each day. 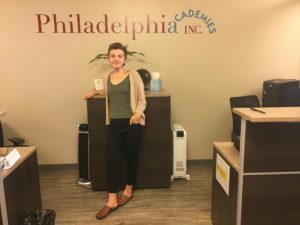 Changemaking for Philadelphia Academies is giving professional development workshops and securing student internships; but for Conemaugh Valley High School, it’s creating a student-run credit union branch. Changemaking for one of my coworkers is going on site visits to high schools to promote our services, while for me it’s staying in our offices. And even within my individual changemaking there is variation, as one day I could be filing, while another I’m researching. As long as we notice and take advantage of all the unique ways to make change, we will continue discovering innovative approaches to make a greater impact on solving complex issues.